Line a baking sheet with aluminum foil. Cut your sweet potato in half and cover each side with oil, sugar, and salt. Roast for 15 minutes or until tender and caramelized. Remove from oven, allow to cool. Scoop contents into a food processor and blend until smooth; alternatively, smash with a fork. Use for monkey bread recipe below. In the bowl of a stand mixer, fitted with a paddle attachment, pour in water, yeast, and sugar. Allow to sit for 5 minutes until foamy. Turn mixer on medium-low and add salt, purée, egg, butter, and vanilla. Mix until ingredients are incorporated. Turn mixer speed down to low, add flour, one cup at a time until dough is not sticky and pulls slightly away from the sides of the bowl. Change to the dough hook attachment and turn on medium speed to knead for 5 minutes. Place in a well-greased bowl and cover with tea towel, let rest for one hour. Grease a standard Bundt pan with a lot of butter and flour. Sprinkle ¼ of brown sugar and a few marshmallows and nuts evenly over the bottom of your Bundt (which, when inverted, will be the top). Punch dough down after one hour of rising. Using a sharp knife or bench scraper, cut dough into four equal pieces, then cut each piece into eight equal pieces (for a total of 32 pieces). Roll each one into a smooth ball. Layer the bottom of the Bundt pan with about half of the dough balls. Cover evenly with about half of the remaining sugar, nuts, and marshmallows. Repeat with remaining dough balls and sugar/nuts/marshmallows. Cover with tea towel, and let rest for 10 minutes. 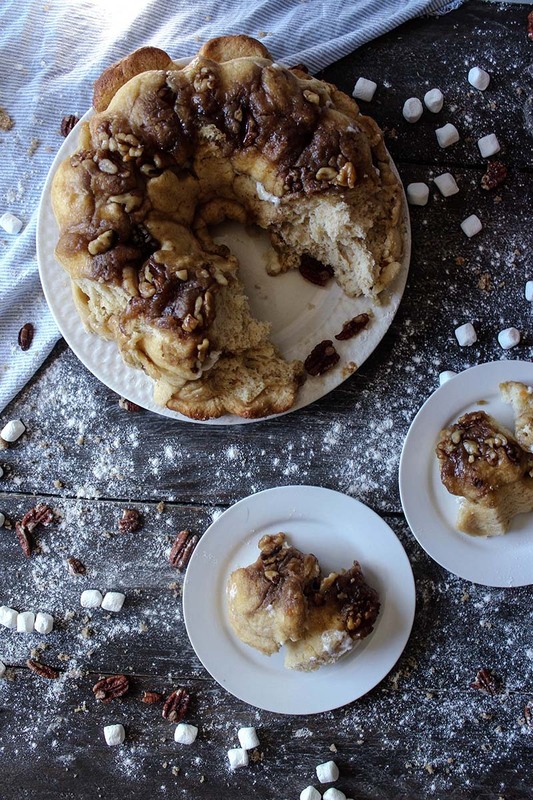 Place Bundt pan on a cookie sheet to avoid any messes in your oven—the marshmallow can get sticky!). Bake for 35 minutes or until golden brown and puffy. Remove from oven and allow to cool for about 10 minutes. With oven mitts, invert Bundt onto a plate and gently remove from pan. As a Senior Citizen vegan, this recipe could be veganized quite easily. One omission would be the marshmallows!! Why ruin a lovely bread filled with sweet potato, nuts, all naturally-sweet ingredients with “store bought” nasties like marshmallows? we love, use, and recommend using Red Star yeast products and recipes!! Thank you for this basic and usable bread recipe.